Brief Synopsis – A Cuban immigrant to the US gets involved in the Drug trade with hopes that he will be able to still remain loyal and trustworthy when he reaches the top. My Take on it – This is a classic film that once again showed how great an actor Al Pacino can be. He is superb in this film and does an amazing job portraying the title character as he changes during the film. They explore some great ideals here and the way that they present what can happen to someone a she climbs the ladder of success (in any field) is quite interesting to observe. This is not a film for those with weak stomachs because there are many gruesome, violent scenes filled with lots of bloodshed but it still remains quite realistic looking and flows in the way we would expect from such a storyline. 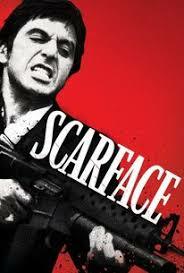 Bottom Line – Pacino is amazing in this film and does a wonderful job in the title role. The ideals explored here are quite interesting because we get to see the changes one goes through as they slowly climb their way to the top. Not for those with weak stomachs because the violence and bloodshed is quite realistic and free flowing. Recommended! Love this film. It’s one of my all-time favorites. That trivia is remarkable. I’ve heard it before but it still blows me away. love trivia like this too. i liked t a lot, but cant say i loved it! tnx 4 stopping by and commenting Dell!